Located on Nehru Road, this majestic building of Pine Ridge Hotel with its grand British architecture stretches up to the entrance of Chowrasta Mall. When you look up from the Nehru Road and see the building with its impressive shopping arcade facing the road, you wonder how can this be a budget hotel after all? It can't be anything less than a 3-star hotel! Well that's the question I had too before I explored the hotel, which is now a heritage building that was built over 130 years back during the British colonial days. If you look carefully from outside, you will notice some broken window panes. Well, who knows some hooligans may have thrown some stones? Yes, you would still like to discount any possibility of negligence and non-maintenance that may have caused this and like to believe that you actually discovered a gem right in the heart of the hill town at a budget price. But your heart will break as you walk into the reception counter and start exploring the property. As you walk through the huge heavy teakwood doors with glasses, you will see a large antique mirror in front and the reception counter on the right. There are two young guys who are manning the counter. They still manage to keep the smile on their face though. None can speak English. Your first shock is why such grand hotel should have low quality staff? Behind the reception counter, you can see the key rack. I was pleased to see that the keys still come with heavy brass key holders that are no longer seen these days. From the reception and the lounge area, there is a long carpeted corridor that goes to the right with wooden paneling on the wall, and at the end there is another corridor to the left. As you walk along the passage, look around and see the high ceiling, you can feel the intricacies of the colonial architecture. At the same time you can see the stark reality of sheer negligence that this hotel has been going through. There are some broken chairs and tables that lay on the passage as you walk by. The carpets are torn at places. There is a narrow stairway at the end of the corridor that leads to the rooms in the upper floor. The stairway is so narrow that I wondered how they moved the heavy furniture to the upper floor? There are no elevators in the building. There is another approach to the upper floor from the other side which is actually broader. 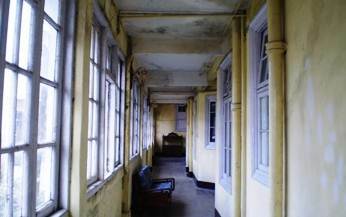 In the upper floor, the degrading condition of the hotel is even more prominent. On one side of the narrow passage, there are wooden framed glass windows opening out to the lawn below. The walls and ceiling of the corridor are damped and showing glaring signs of aging. There are some 40 rooms in the hotel. However only some are now available for the guests. 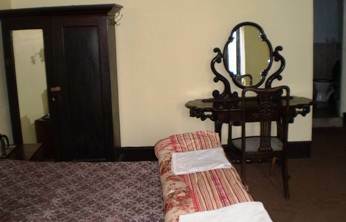 There are standard and deluxe rooms, and also ones with three beds. 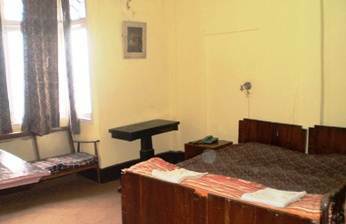 Rooms are large and have teakwood and mahogany furniture that are mostly antique. There is a dressing table with an oval mirror with carved mahogany wood and an antique chair. The large wooden cupboard has a full size mirror. The rooms also have a sofa (usually of cane) and a table where you can relax and have your tea. Rooms are carpeted. However I have seen stains and wrinkles in the carpet. They don't seem to be cleaned regularly. The rooms also have fireplaces. However looking at one of them, I wasn't sure whether that could be actually put to use. There is a TV (non LCD) in the rooms with standard cable channels. Some of the rooms have been recently done up and are better than the older rooms. For example room #202 is a nice large room with a blue carpet. It has curved and corner bay windows with sofas and have nice views. Other rooms (as the one below) are very ordinary. As you can see in the picture below, two single cots have been joined together to make a double bed. Cracks and damps are evident in the walls. Bathrooms floors are mostly mosaic finished and quite large. They have geysers and hot water is available in the morning. However, don't be surprised if you find one of the taps in the wash basin broken. That was the case in the bathroom that I used. There are some rooms in the hotel that have been reserved for private use. You will see name plates on them, and some of them are British names like Douglas. I wondered how long those rooms have remained locked and what may be there inside. Pine Ridge is a lodging only hotel. There is no in-house restaurant. However you can ask a waiter to bring food from outside. The service is ordinary and mostly done by untrained staff. They do provide tea in the morning. The hotel has generator which they switch on after dark if there is a power failure. The generator supports the emergency lights in the rooms. However, you will need to use candle lights after 11pm at night. 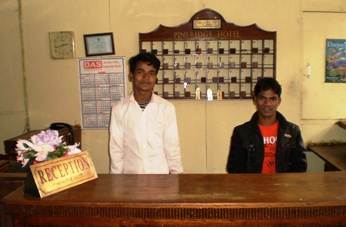 So with all my observations above, will you stay at the Pine Ridge hotel in Darjeeling? Here are some more points to ponder before you take the final decision. Pine Ridge after all falls in the category of Budget or Cheap hotels. During the low season the rates are really attractive. The manager and the owner are nice persons who can help you with the type of accommodation that may be suitable for you. The hotel is located right at the corner of the Mall and you can not really ask for a better location when it comes to shopping, restaurants and central access to all the major attractions. There is a shopping arcade right below the hotel and facing the Nehru Road that has a series of shops including the Pine Ridge Travels. 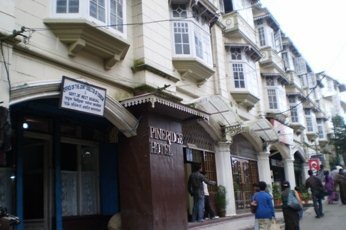 And lastly, if you have a fancy to stay in a palatial heritage building that was built in the British Raj days and enjoy the colonial charm, where else can you get the opportunity of staying so cheap? 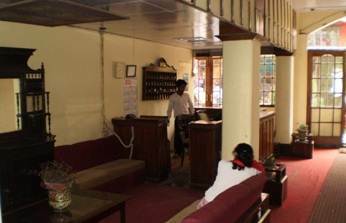 1) Top Darjeeling Budget Hotels to know about the best cheap hotels in Darjeeling. I went to Darjeeling with my family to enjoy the beauty of Darjeeling in October. I have booked Pineridge hotel, it was situated in a very nice location and rooms were also good. Mr Suraj was so nice he arranged the car for tour, all staffs were good, Depesh & Voves were so helpful to me but some staffs behaved rudely. Thanx for everything. I refer to all guests to choose Voves & Depesh for better room service.